As many of you will know I have been a big fan of MINTD since their first box. There have been countless hits, a few misses (to be expected with any sub box) and lots of favourites, but this box is easily one of the best they have ever done. Usually I find a couple of products that I like, possibly one I don’t and then one (maybe two) that I absolutely love. In this case I love every single product. Not only that, the savings with this box is one of the best they’ve had. The value is a whopping £201, but the cost is just £70 for four full size products from amazing brands. That alone should have you running off to order one (here), but if you would like to know a bit more about the products before you do then keep reading. Ingredients: Aqua (Water), Glycerin, Sodium Citrate, Citrullus Lanatus (Watermelon) Fruit Extract, Butylene Glycol, Propylene Glycol, Punica Granatum (Pomegranate) Fruit Extract, Coceth-7, PPG-1-PEG-9 Lauryl Glycol Ether, Phenoxyethanol, Carbomer, Maltodextrin, PEG-40 Hydrogenated Castor Oil, Chlorphenesin, Parfum (Fragrance), Lactic Acid, Calendula Officinalis Flower Extract, Papain, Ginkgo Biloba Leaf Extract, Citric Acid, 1,2-Hexanediol, Caprylyl Glycol, Potassium Sorbate, Sodium Benzoate, Linalool, Algin, Tetrasodium EDTA, Methylparaben, Butylparaben, Ethylparaben, Propylparaben, CI 16035 (Red 40). First up I have to talk about this lovely product because I have been using it for almost a year now already. Su-Man are one of my favourite brands and after trying almost everything in their lineup, I haven’t found a dud yet. 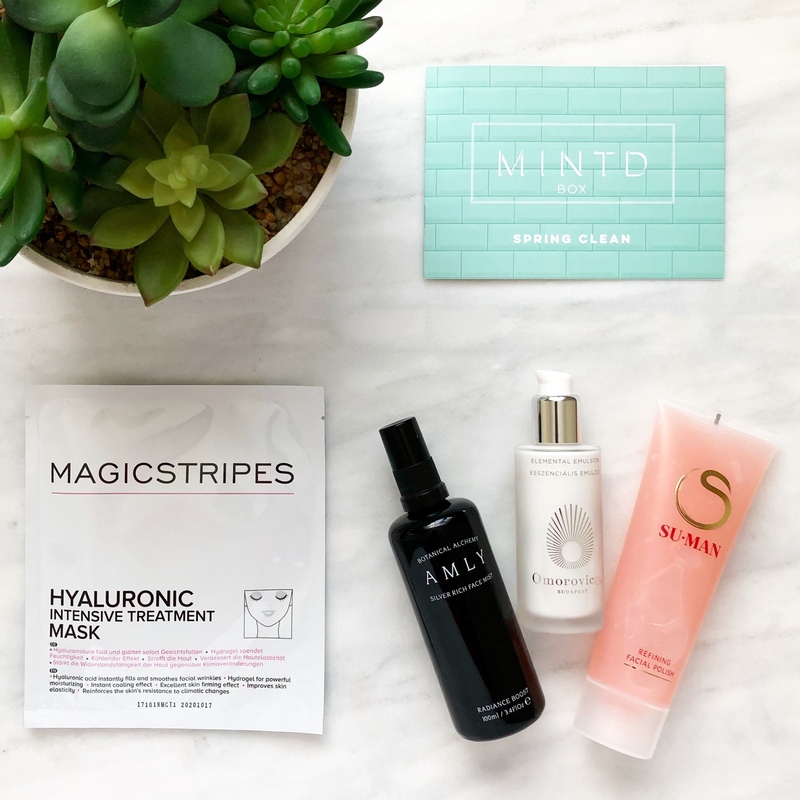 I first discovered them in the August box (review here), which featured their excellent Rehydrating Toning Essence and since then I have fallen for their cleanser, sheet masks and brightening serum. This product is one I wasn’t expecting to like as much as I do and that’s down to the fact that it contains lactic acid, which is an ingredient my skin doesn’t love. Despite that, I tried it and was pleasantly surprised to find that my skin did not reaction and was left feeling soft, smooth and most importantly calm. I know many products like this can leave your skin looking red and feeling raw, but this is very gentle and does not contain any actual physical exfoliants. The physical part comes from you massaging it in to the skin and the combination of lactic acid, watermelon fruit, gingko biloba extract and pomegranate enzymes work together to refine, brighten, regenerate the skin all without being drying or irritating. I use this about 2-3 times a month when my skin needs a gentle pick me up and that’s exactly what it does. It helps to refresh my skin, but also has anti-inflammatory, antioxidant and soothing properties that mean even if my skin was very dry (like it was most of winter), it wouldn’t make that worse. It has a light and cooling gel texture that you apply to clean skin and after massaging it in for a couple of minutes all you need to do is rinse and carrying on with your usual routine. This would be great as a quick morning exfoliating cleanser and because of how gentle it is it should work for pretty much all skin types. The only issues I can think of would be the dye (which I am not a fan of in skincare at all even though it gives this product it’s pretty pink colour) or the preservatives, which I know many aren’t a fan of. Saying that, those ingredients are at the very end of the inci list, which means they are included in very, very small amounts so should not be an problem, but it’s still something to note. Ingredients: Aqua, Citrus Aurantium Dulcis (***Sweet Orange) Flower Water, Rosa Damascena (Rose) Flower Water, Anthemis Nobilis (Roman Chamomile) Flower Extract, Lactobacillus Ferment, Aloe Barbadensis (***Aloe Vera) Leaf Extract, Glycerin (Vegetable), Brassica Campestris (Rapeseed) Seed Oil, Achillea Millefolium (Yarrow) Flower Extract, Hypericum Perforatum (St John’s Wort) Leaf Extract, Alchemilla Vulgaris (Lady’s Mantle) Leaf Extract, Hibiscus Sabdariffa (Hibiscus Berry) Flower Extract, Vaccinium Myrtillus (Bilberry) Fruit Extract, Crataegus Monogyna (Hawthorn Berry) Fruit Extract, Sambucus Nigra (Elderflower) Flower Extract, Althaea Officinalis (Marshmallow) Root Extract, Equisetum Arvense (Horsetail) Extract, Hydrolysed Hyaluronic Acid, Bis (Tripeptide-1) Copper Acetate, Pisum Sativum (Pea) Peptide, *Citrus Aurantium (Neroli) Flower Oil, *Tilia Cordata (Linden) Flower Oil, *Rosa Damascena (Rose Otto) Flower Oil, *Boswellia Carteri (Olibanum) Gum Oil, *Jasminum Grandiflorum (Jasmine) Absolute Flower Oil, *Matricaria Chamomilla, Glucose, Benzyl Alcohol, Selaginella Lepidophylla Extract, Polyglyceryl-4 Caprate, Silver Citrate, Citric Acid, Dehydroacetic Acid, **Limonene, **Linalool, **Geraniol, **Citral, **Farnesol, **Citronellol, **Benzyl Benzoate, *Natural Pure Essential Oils **Potential Allergens ***Certified Organic Ingredients. I was so excited to see this product in the box. I have had my eye on Amly for awhile now, but thanks to my already overflowing toner/mist stash (remember this post?) I wasn’t able to try them until now. After using this ethereal beauty almost every day for a month I could kick myself for waiting so long to try it. It is hands down one of the loveliest mists I’ve tried and combines excellent ingredients with that feel good experience that makes using it such a pleasure. Amly is a beautiful botanical brand founded by Lisa and Kerry and based out of Lisa’s organic farm in East Sussex. The brand was born after discovering a silver rich spring water running under a meadow on the farm and this mist is the first product they made combining that water along with wild flower extracts, essential oils and one of my favourite ingredients, copper tri-peptide-1. That’s what makes this mist so special. It goes beyond just smelling gorgeous, which is does thanks to the Jasmine oil and being “nice” to use, which again it is thanks to the chic yet functional packaging and includes ingredients that elevate the mist to something more science based and results driven. Even though I love the scent and could not love the packaging more (the nozzle gives the most perfect “fine mist” spray), what I enjoy the most about this is what it does for my skin. It is hydrating and soothing, but more importantly healing. Between the silver, which is scientifically proven to be antimicrobial, antibacterial, antioxidant as well as regenerative and copper peptide, this is such a good product for those with acne prone skin because it will help to heal blemishes without drying out the skin. Not only that, ingredients like St. John’s Wort and Aloe Vera work together to really soothe and calm the skin. I am pretty much addicted to this stuff. I give my face a liberal (excessive) spritz after cleansing and before my serums and I absolutely believe it has made a difference it how my skin behaves. It seems more balanced and resilient and I cannot get enough of the healing properties of the silver. I have wanted to incorporate this ingredient into my skincare routine for awhile now and I think this mist is proving to be the perfect way to do that. It’s definitely on the expensive side, but if it’s in your budget then give it a go. It smells very similar to May Lindstrom’s The Jasmine Garden and is a lot cheaper with a much more exciting inci list. Ingredients: Water, Glycerin, Kassou Ekisu, Betaine, Butandiol, Aloe Yohjyo Matsu Ekisu, Hydrolyzed Collagen, Rosa Rugosa Leaf Extract, Trehalose, Hyaluronic Acid, Tocopherol, Carbomer, Anthemis Nobilis Flower Extract, Phenoxyethanol, Ethylhexylgylcerin. I got this box while I was on a working “vacation” in LA and these Magicstripes sheet masks were so helpful. After a series of flights, harsh winter weather and the dry Californian air my skin was not happy at all. My usual combination but oily leaning skin was so dry and uncomfortable, but thanks to these I was able to correct that quicker than I did the rest of my body (more on that in a future post). I have used the magicstripes sheet masks before thanks to MINTD and while I loved the eye patches and detox mask, this one really proved itself. Like most hydrogel masks this is very wet and almost slimey, is a bit fiddly to apply, but once on it feels very cooling, soothing and hydrating. It comes it two parts so it wasn’t hard to get it fit my face and it is so saturated that I was able to leave it on for longer than suggested without it drying up. There is also a lot of essence in the packet which can be applied after you remove the mask. The inci list on this is short, but decent with brown algae, aloe vera, collagen, hyaluronic acid and chamomile extract to soothe, plump, hydrate and firm the skin. The essence has a light floral scent and after wearing my skin felt so much better, which is exactly what I want from any mask. Even though these work out as quite expensive (£10 each) they are a good option if you have very dry skin. Sheet masks aren’t my favourite to be honest, so I’m always happy when I find one that actually gives good results and doesn’t irritate my skin. If these are out of your price range then check out the hydrating masks from Patchology. I discovered them through MINTD last year (review here) and you get 4 for £28. While I love those for my usual combo skin, I think these ones are the best choice for very dry/dehydrated skin. 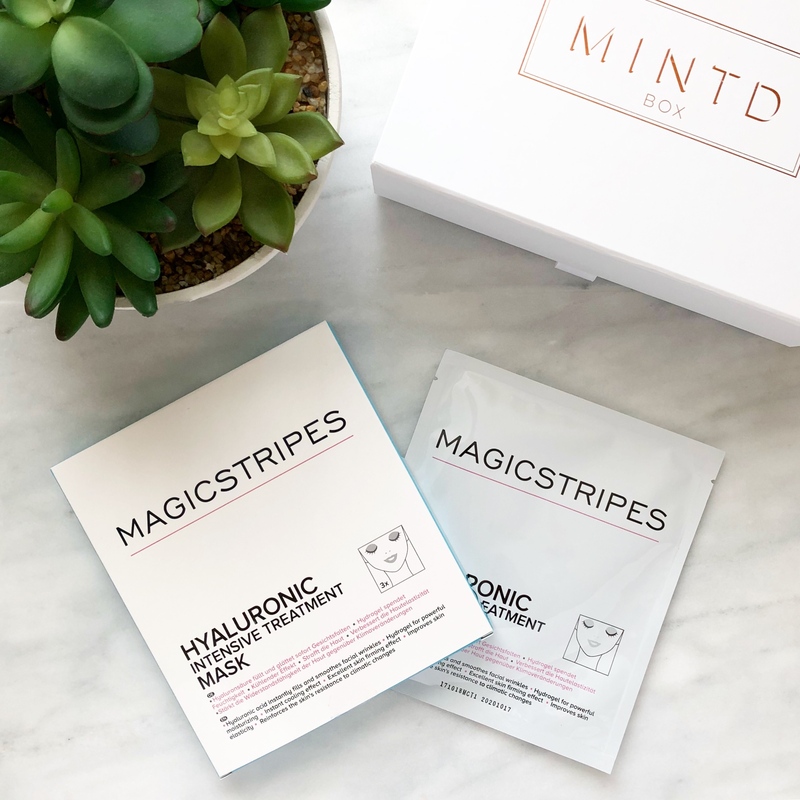 Magicstripes are a great little sheet mask brand and I am so glad I got to try these and at the time I did. It’s not often I get to put products to the test when my skin is actually acting up, so doing that meant I got to see just how effective this product could be. I have been a huge fan of Omorovicza for years and I promise you there is a dedicated post in the queue that I have been meaning to share for far too long now, but first this unexpected gem. 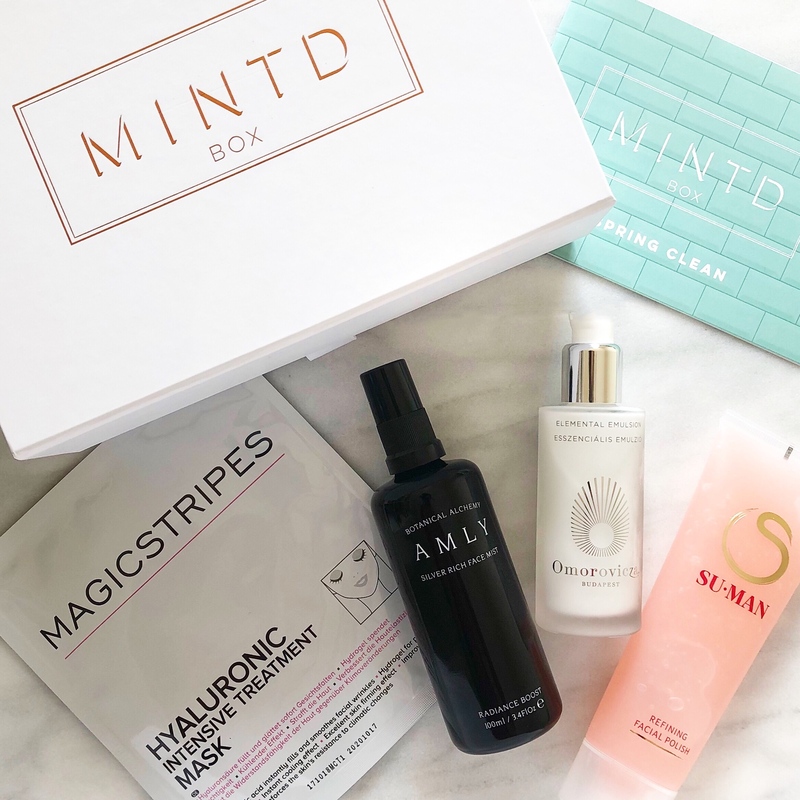 Since I first discovered the brand I have tried so many of the extensive lineup and long time favourites include the cult status mist, three of the cleansers (especially the Moor Cream Cleanser), the face oil and multiple of their excellent masks. Despite my long time love for the brand I never considered trying this product, sure that it wouldn’t work with my combination (and moisturizer adverse skin), but oh how wrong I was. My skin type struggles when it comes to moisturizers. I’m acne prone, a little sensitive and combination/oily, which means finding the right one isn’t easy. Over the past year or so I have been lucky to find a few that I actually love and now this is one of them. It is incredibly lightweight and has a thin, watery texture that sinks in so easily and doesn’t feel heavy on the skin at all. ‘Emulsion’ is the perfect name for it because that’s exactly how it feels – very fluid, almost serum like and not at all creamy or thick. It is hydrating without being cloying and I don’t feel like my skin is being suffocated when I have it on. The best part is this has managed to keep my skin balanced and calm and not caused any breakouts at all. As for the scent, it’s mild but lovely and floral and doesn’t linger once you apply the it. The ingredients list is typical for Omorovicza with their Hungarian Thermal Water at the top of things and while the rest might look underwhelming in terms of length, it’s actually an excellent combo that helps the skin feel and appear brighter, smoother and more balanced. This should work well for all skin types and those with very dry skin might consider layering this with the new Magic Moisture Mist, which sounds amazing. I apply this (two pumps) on days when I’m not wearing sunscreen and keeps me hydrated and doesn’t leave me looking greasy come nighttime. My mum has also tried to claim this as her own because it’s that good and I think between us we might be at least 1/3 of the way through the bottle (if not more) already, which goes to show you how much we love it. Even though I loved everything in the box, this was probably my favourite of the favourites. I was so surprised by the texture and results, and it goes to show you that an inci list is only part of the story when it comes to skincare. This is definitely expensive, but if you are like me and find it really hard to get along with most moisturizers then this could be exactly what you’ve been looking for. This box is well worth it for this product alone and I might have to order another one so my mum can have her own! As I said earlier the value of this box speaks for itself, but if you were in any doubt that the products were worth it then I hope this blog post settled that. I can see myself repurchasing every product here and I don’t think that has happened with the previous edits. If you want to know more about getting a box for yourself you can click here and you have the choice of a monthly or bi-monthly service. Not only that, if you sign up to the 6 or 12 month subscription you get a free Omorovicza product (it’s a good one) that retails for £50. I know this sub box is expensive, but that’s exactly what you’re getting – high end products at a massive discount. Overall I could not be happier with this box. It was the perfect products at the perfect time and my skin is in a great place thanks to using them over the past month. Reblogged this on MissAmytou76's Blog.